I heard that Ms. Obama is taking credit for the positive "cultural shift" in US eating habits. Huh! I mean, her methods are SO motivating! She's really making an impact. Did you see her on the Leno show berating an Olympic champion? Obviously, those kind of athletes can really USE health tips. She told Gabby Douglas, a Gold Medal Gymnast who splurged with an Egg McMuffin, "You're setting me back, Gabby". I love those revealing words. It's not, "You're setting YOURSELF back" or "That's not good for YOU"...but..."You're setting ME back, Gabby"
She is pushing HER agenda in many different arenas across the country: even museums and zoos. I hypothesized that it even extended to the diet of the zoo animals. A tiger there seemed so starved that even a scrawny 4 year old looked appetizing. But that was an isolated occurrence. I needed more data. Michelle has starved them so severely..
that he even wanted to eat me. 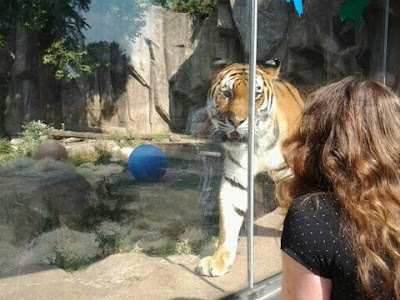 [Tiger thought] "I bet she'd taste like cookies"